Americans generally do not like being told what to do or how to think. 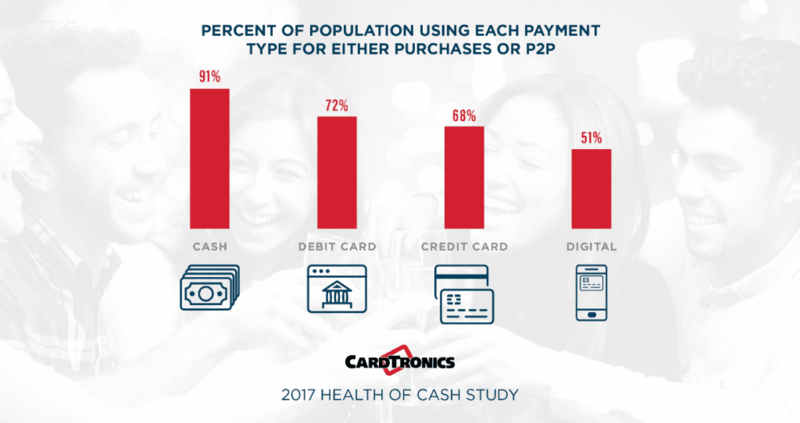 And based on the results of the 2017 Health of Cash Study – a Cardtronics collaboration with independent research company Edelman Intelligence – they aren’t interested in being told how to pay, and will likely push back on retailers’ cashless experiments which eliminate freedom of payment choice. While many consumers are indeed adding smartphone-driven digital pay options into their payments toolbox, cash continues to resonate with American consumers, who show little interest in being ‘all in’ with cashless, or having their choices limited in any way. Contradicting an assumption that cash is fading away in the digital age, the Health of Cash Study reveals that not only do consumers continue to use cash, but in fact cash remains the most commonly used payment method by a comfortable margin, used by nine out of 10 consumers in the past six months, and by 80 percent on a monthly basis. Indeed, the data is clear that cash usage is woven deeply into the fabric of Americans’ payment behavior. When asked “Which is your most preferred payment method?” consumers selected cash as their second most-preferred method, at 27 percent, just behind debit cards at 33 percent. Credit cards, digital and checks rounded out the list with 22 percent, 15 percent, and 3 percent, respectively. And the most preferred way to pay for millennials? Cash, at 29 percent, followed in a close grouping by debit card (26 percent), digital (25 percent), then credit card (17 percent) and finally checks (3 percent). Yes; you read that right. 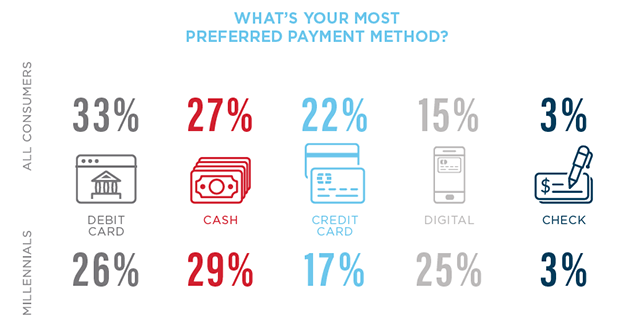 Millennials’ most preferred way to pay is cash. The Health of Cash survey results suggest there are three key truths that guide consumers in their payment decisions. Despite the rise of digital payments, people don’t think cash is going away, and they aren’t longing for a cashless future because they value cash’s unique attributes against the backdrop of all three truths. The idea that consumers want to be limited to cashless payments is not consistent with consumer behavior. 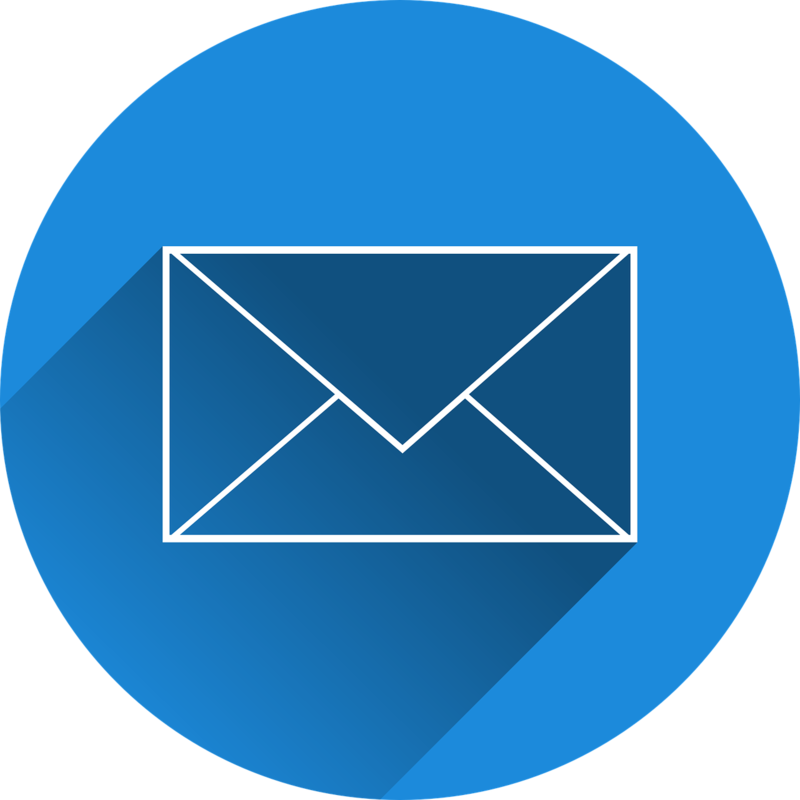 Consider: 89 percent of people like having the ability to use a variety of payment methods; 90 percent of consumers use at least two payment methods a month; and 82 percent of people would miss cash if it went away altogether. What’s more, and regardless of their personal payment preference, 61 percent of consumers admit they get upset when establishments don’t accept cash – and among millennials there’s an uptick to 68 percent. Consumers want their preferred payment method to be both convenient and easy to use, and they feel most payment methods deliver those attributes to varying degrees. However, when the choice of ‘how to pay’ hinges on safety and privacy, cash clearly separates from the payments pack – most notably on privacy (e.g. doesn’t track purchase behavior) – a benefit that cashless cannot deliver. 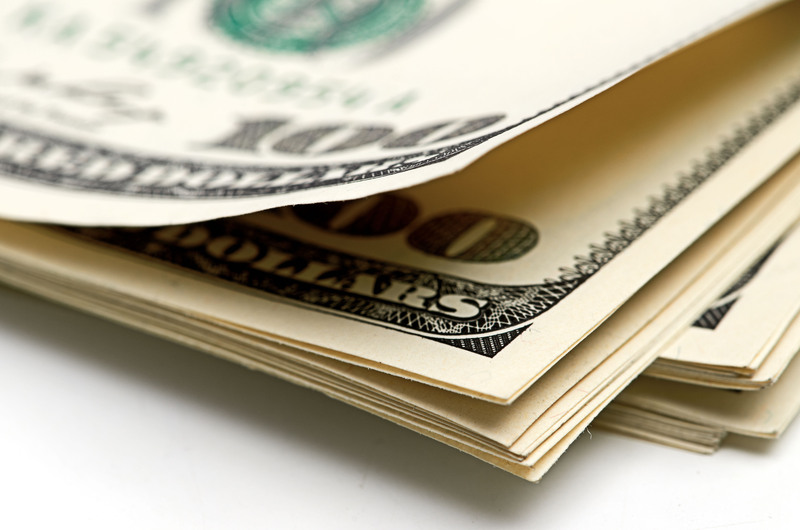 Cash is identified as the safest (48 percent of survey respondents) and most private (60 percent) way to pay. Truth Three: Payment options should empower financial well-being and inclusion. Concerning financial well-being, the Health of Cash Study finds consumers agree that cash is a great way to control spending and maintain a budget. In fact, consumers believe cash is the single-best payment method to help keep them from overspending. Cash was selected by 47 percent of consumers; debit was second place at 23 percent. As payment types relate to societal inclusiveness, the Health of Cash Study findings paint a clear picture of a segment of society disadvantaged in a cashless America focused on digitizing all transactions and financial services. As reported by the FDIC, approximately 33.5 million U.S. households are either underbanked or unbanked, and largely disconnected from the traditional banking system. Digital-only retail and payment environments often exclude these Americans, whereas cash is universal within our society. Having a smartphone is one thing; having a smartphone AND the banking relationship necessary to load a mobile wallet with a debit or credit card is quite another. When the Health of Cash survey asked for all payment methods, “Is everyone able to use this?” 94 percent responded positively to cash, compared to 67 percent for credit, 73 percent for debit and 66 percent for mobile wallets. The 2017 Health of Cash Study continues to underscore the falsity of the cashless America narrative. While cash may not always be the most-preferred payment option in all scenarios, it resiliently remains the most commonly used form of payment, and there are many instances where it is still exactly what people want, and precisely the way they want to pay. Indeed, there is compelling evidence that cash has formed a durable and enduring bond with American consumers. 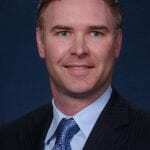 Brian Bailey is Managing Director ̶ North America for Cardtronics, the world’s largest ATM owner / operator. A global financial services technology executive with domain expertise in the consumer transaction technology sector, Mr. Bailey has deep knowledge of retail financial services with a unique view of the changing consumer at the intersection of technology, regulation and omni-channel expectations.